The FDA does not require warning labels on highly caffeinated products, but this may change. Sometimes caffeine amounts are listed on a label – and sometimes they’re not. Even though caffeine is a drug, the U.S. Food and Drug Administration treats it differently depending on the type of product it’s in – such as medicines, dietary supplements, or food – which makes for a world of consumer confusion. In the U.S., the FDA considers caffeine safe enough to permit people of all ages to consume it. Regulations for some food and drinks do limit caffeine amounts, restrict marketing claims, and set up guidelines for consumer information. But in other cases, regulations are almost nonexistent. Internationally, a few countries have taken the lead in establishing more rigorous consumer labels and guidelines, especially on energy drinks. Because several teen deaths have been claimed to be linked to energy drinks, the FDA is scrutinizing the entire caffeinated-product industry, but has yet to make any real policy changes. Some energy drinks have toned-down their marketing tactics to teens and kids, to avoid further scrutiny and public backlash. Some beverage companies in the U.S. – like Monster Energy – are voluntarily changing their labels, or in some cases, their formulas, in responses to public pressure. They’re no longer dietary supplements, but instead are beverages, and this means different labeling, but with the same amount of caffeine. Even the FDA admits the rules on caffeine are a little wacky. While the rules haven’t changed in decades, the products they regulate have changed, in ways no one would anticipate. The following sections cover the basics on caffeine labeling, with tips every consumer should know. Caffeinated energy drinks, energy shots, sports gels, weight-loss products, caffeinated gum, and other caffeine-added products are typically regulated as dietary supplements; though as the previous section explains, some energy drinks are now reclassifying themselves as beverages. So what constitutes a dietary supplement, and how did FDA regulations get to be so loose? The FDA defines a dietary supplement as a product taken by mouth that contains a “dietary ingredient” intended to supplement the diet. The “dietary ingredients” in these products may include: vitamins, minerals, herbs or other botanicals, amino acids, and substances such as enzymes, organ tissues, glandulars, and metabolites. Dietary supplements can also be extracts or concentrates, and may be found in many forms such as tablets, capsules, softgels, gelcaps, liquids, or powders. At first, the FDA considered dietary supplements to only consist of such essential nutrients as vitamins, minerals, and proteins. In 1990, “herbs, or similar nutritional substances” were allowed. In 1994, dietary supplement rules were expanded to allow non-essential nutrients, such as ginseng, garlic, enzymes, fish oil, and caffeine, for instance. Congress heeded to lobbyists and passed the Dietary Supplement Health and Education Act (DSHEA). As long as makers of dietary supplements made no unsubstantiated claims that their products treated, prevented or cured diseases, FDA barriers were dropped. Today, the FDA puts no limits on the serving sizes or amounts of ingredients in dietary supplements. Manufacturers are responsible for ensuring their products are safe, and if an ingredient is itself new, the FDA must first review the safety data on it. But otherwise, dietary supplements are pretty loosey-goosey; they don’t need FDA approval before marketing. nutrient content claims – the amount of a nutrient or dietary substance in a product. How Is Caffeine Listed on a Dietary Supplement? 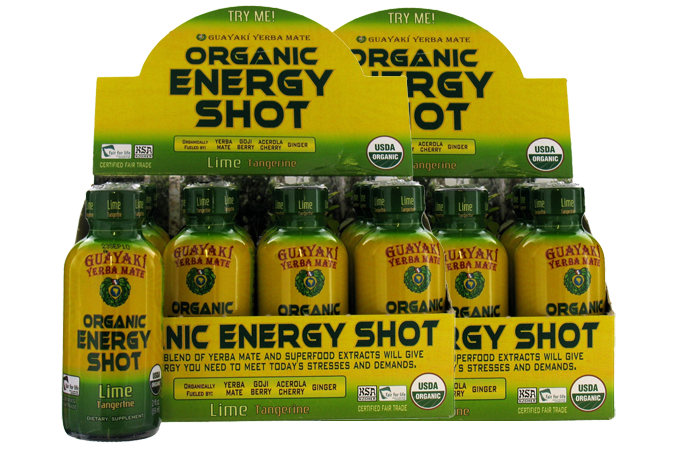 You’ll often find guarana and yerba mate (or mate) listed as “Other Ingredients,” especially in energy drinks and shots.